BEIRUT (Reuters) - U.S. President Donald Trump's call for recognition of Israeli sovereignty over the occupied Golan Heights was manna from heaven for Prime Minister Benjamin Netanyahu two weeks before an election. But allies and enemies can agree on one thing: Trump's statement last Thursday was a turning point in U.S. policy over territory Israel captured from Syria in a 1967 war and annexed in 1981, in a move the U.N. Security Council declared unlawful. "I am confident that the Lord is at work here," U.S. Secretary of State Mike Pompeo, who was in Israel when Trump made his announcement on Twitter, told the Christian Broadcasting Network in an interview. But Trump's decision, following U.S. recognition of Jerusalem as Israel's capital in December 2017, could tempt other powers to annex land, undermine the roll-out of a U.S. Middle East peace plan and tilt Israel back into conflict with its Arab neighbors, Middle East analysts say. "Donald Trump has made sure that Israel will be in a perpetual state of war with its Arab neighbors for many decades to come," said Fawaz Gerges, professor of international relations at the London School of Economics and author of the book Making the Arab World. "What Trump has done is to hammer a deadly nail in the coffin of the peace process and Arab-Israeli reconciliation. This is a fundamental turning point. There is nothing left to discuss anymore." Trump's move is, according to many analysts, partly intended to boost his own chances of re-election in 2020, by targeting the vast pool of U.S. evangelical Christians. Many of them voted for his in 2016 and they are championed in his administration by Pompeo, Vice President Mike Pence and others. Most have ticked the wish-list of Israel's right-wing government and met longstanding demands of its U.S. supporters, including U.S. recognition of Jerusalem as the capital. The Arab east of the city was occupied by Israel and then annexed after 1967 in a move that is legally repudiated internationally. Trump's Middle East envoy, Jason Greenblatt, said it was inconceivable Israel "would allow the Golan to be controlled by the state of Syria or by any of the rogue actors operating in the areas, including Iran." But with Sunni Arab leaders dealing with crises in Yemen, Syria, Libya, Algeria, Sudan and Qatar, and their standoff with non-Arab Shi'ite Iran, they are less focused on Israel. In particular, they did not appear to have blocked behind-the-scenes security contacts developed in recent years between Israel and the United States' Gulf allies over their common enemy Iran, the person said. 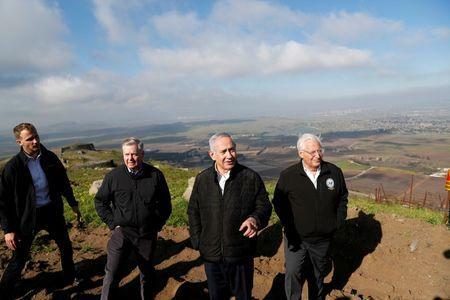 Aides' advice to Trump on recognition of Israeli sovereignty over the Golan Heights was that Washington could again weather the storm, the same person said. John Bolton, Trump's national security adviser and one of the administration's leading Iran hawks, was an important proponent of the policy shift, the official said. The Trump administration has identified Iran as its main target in the Middle East, and withdrew from the deal signed by Tehran, the United States and other world powers in 2015 on curbing Iran's nuclear program. "This will give further power to the Iran axis of resistance between Iran-Hezbollah-Assad against Israel and the U.S.," said Galip Dalay, visiting fellow at Oxford University and a fellow at Brookings Doha. "This axis has just been given a very strong symbolic victory and this will give them the high ground." He said Arab leaders could not publicly support Trump's decisions on Jerusalem and the Golan Heights because it would threaten their popularity, in some cases already low. "From the Arab standpoint, this makes them more hesitant to be supportive because the political space they need to maneuver has been eroded," said Dennis Ross, a veteran Middle East negotiator. "Each move by this administration has put Arab states on the defensive." Ross also suggested that U.S. recognition of Israel's sovereignty over the Golan Heights could embolden the Israeli right-wing to step up its push for annexing settlements in the occupied Palestinian West Bank. "I worry that the right in Israel can say 'they recognized this. It will be a matter of time before we can annex all or part of the West Bank'," he said. "That would be the end of the two-state solution."